In addition to work, TA-ing, grading, and working on my prospectus, I've been toiling around with creating rules that approximate how I would have played D&D if I had been an adult when the original Little Brown Books were published. 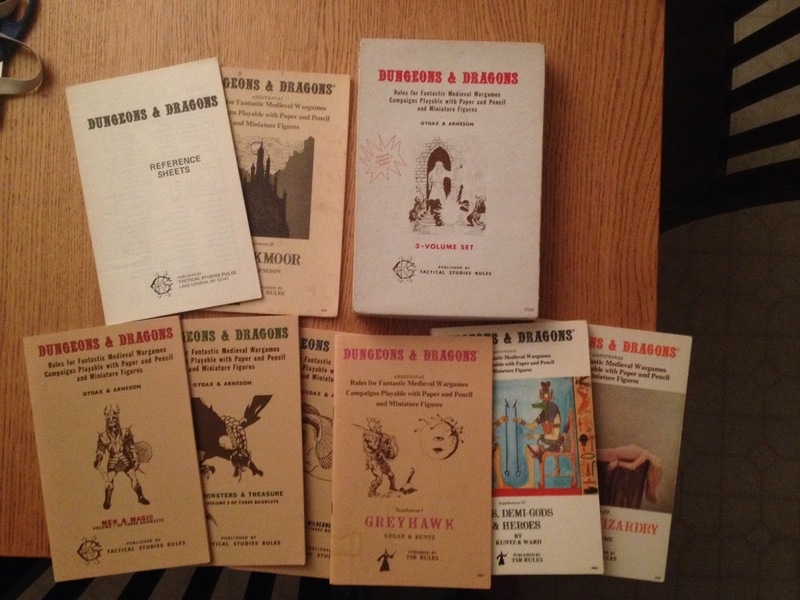 I've been reading and re-reading the Chainmail rules and reading sections of the original D&D rulebooks to get a sense of how I would have understood those rules if I had never played the game, no one was there to teach me the game, and all I had was these physical documents from which to develop a game. It's an interesting challenge, but it's the challenge that many early gamers faced. I've been a fan of the fanzine Alarums & Excursions since it was first introduced to me by Gary at Aero Hobbies. Gary, who is sadly no longer with us, was a central figure in the Southern California role playing game scene. His gaming group is responsible for the creation of the Thief Class for D&D, think about that the next time you backstab someone in game play. When I walked into Gary's store, I was new to the Los Angeles area, but he quickly made me feel at home in this metropolis and introduced me to a number of wonderful people. He was a one man social network, and the issue of Alarums & Excursions he first handed me was like a social network in print form. Prior to reading this issue, I had heard of the zine but I had no idea what to expect. What I found was that it was like reading the best parts of a very creative discussion forum, a forum where people didn't hastily respond and thus where the worst of forums rarely reared its head. What most amazes me about Alarums & Excursions is the creativity, this is especially true in the early issues. Reading the first few issues of the zine - and I'll be discussing my adventures reading the zine in detail in a series of posts - I was struck by how varied the interpretations of how to play D&D were. I'm not saying that I was struck by the differences in "house rules," though those are remarkable as well, rather I was struck by how differently people interpreted the rules of the original books. The early 70s was truly a time when everyone was playing a different version of D&D, and that makes the era all that more exciting to me. So I want to try to capture some of that magic. I want to play D&D as I "would have" played it if I'd been around then to do so. What would my D&D have looked like? In order to help me on this quest, I've read a couple of other attempts to create rules for "Playing D&D with Chainmail" and I'll share my thoughts on those when I share my version of how to do just that. I've also been reading Craig VanGrasstek's rules for Dungeon written in 1974. VanGrasstek's rules, discussed in the video by Hedgehobbit embedded below, are one player's attempt to reverse engineer D&D from a playing session. Let me repeat that. VanGrasstek's rules are a reverse engineered version of D&D based upon his experience in a gaming session. That's how explosively creative and desiring of new kinds of play the 70s were, it's also what we see a lot of today in the DIY game community. Reading VanGrasstek's rules have given me a sense of the kinds of things that get "lost" in interpretation, and I'll be keeping those in mind as I design "How I Would Have Played LBB D&D." I think it will be a fruitful exercise, and I hope that I'll be able to convince my gaming group into giving my LBB D&D a try. Maybe we can even see a bunch of different versions of D&D in our group and try them all.